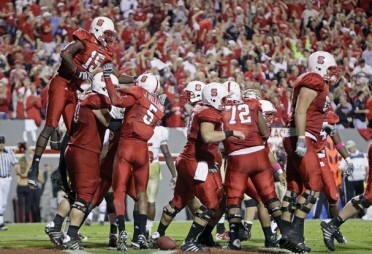 The NC State football team faces a big challenge tonight vs. the #3 nationally-ranked Clemson Tigers. Not too many people (outside of the team) think they have a chance. State is a 14 point underdog. And while Clemson dominated its last opponent, it took State a last second field goal to get past the Richmond Spiders. This is a huge challenge and opportunity for NC State to be triumphant. I’m a firm believer that if you believe it, you can achieve it. A mind over matter attitude beats most challenges. Approaching your challenge armed with a positive attitude can make all the difference in the world. Taking it a step further, expressing positive thoughts to a classmate, teammate, colleague, or loved one can help them overcome as well. Look at the challenges in your life as opportunities to be triumphant and keep track of how much more successful you are. Henry Ford once said: “Whether you think you can, or you think you can’t – you’re right.” Even he understood mind over matter. Let’s hope NC State does as well. And let’s hope they not only believe it, but they achieve it.